Republican bill to end permits and training for concealed carry is dangerous. 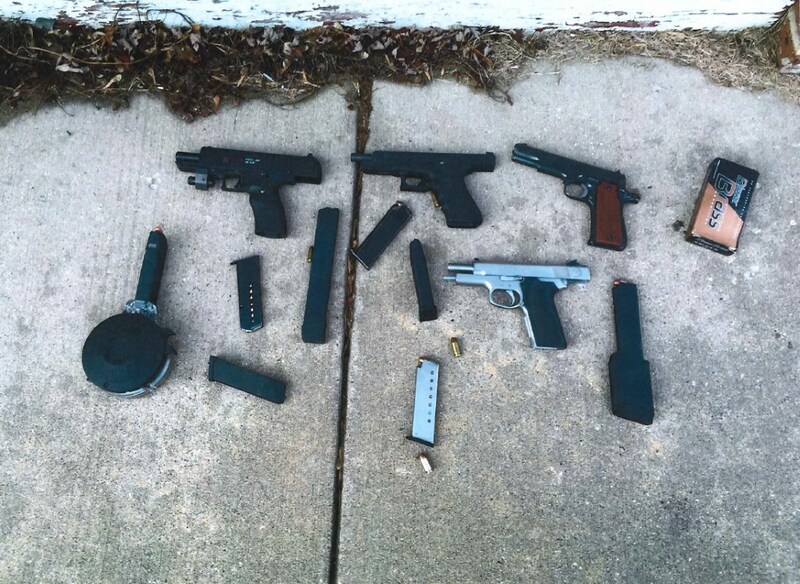 Several guns and tons of ammunition recovered by the Milwaukee Police Department. Photo courtesy of the Milwaukee Police Department. For four decades, the National Rifle Association worked to get concealed carry laws passed, culminating in Illinois becoming the last state to pass such a bill in 2013. Typically those laws required a permit and training for those who want to carry a concealed weapon. Now the NRA wants to upend those laws and grant even greater license to hidden, loaded handguns. It wants concealed carry with no training or permits required, “no license, no fees, no government hoops to jump through,” as state Sen. David Craig (R-Town of Vernon) declared in a press release announcing a bill the NRA says could make Wisconsin the 13th state with such a law, though it appears only nine states have actually passed a permit-less carry law. Craig and Rep. Mary Felzkowski (R-Irma) are among 41 co-authors of the “Right to Carry Act”, as they’ve dubbed it. That right, of course, already exists; this bill simply removes any responsibilities for those claiming this right. The Wisconsin bill would also end the current law’s restriction that prevents people from bringing guns into all police stations, secure mental health facilities and schools in the state; this would now be allowed unless any such institution explicitly bans guns from its property. The measure also allows people to carry tasers, and eliminates the prohibition on carrying guns, bows and crossbows in wildlife refuges, and while operating all-terrain vehicles. “The strange thing about this is I’m not sensing a ground swell of public demand for this legislation,” says Milwaukee County District Attorney John Chisholm, who opposes the bill. No indeed. A recent survey of Wisconsin’s registered voters found 91 percent supported a requirement that a background check, permit and fee should be required of anyone carrying a concealed weapon. That included support from 86 percent of gun owners in the state. And just 21 percent of voters supported allowing people to bring concealed weapons into K-12 schools. Chisholm and Flynn have pleaded with Wisconsin legislators to tighten the guidelines for concealed carry, to prevent “habitual offenders” (who’ve committed at least three misdemeanors) and those convicted of misdemeanors such as “endangering safety by use of a dangerous weapon” or “pointing or aiming a gun” from getting a permit to carry. So far, no one from the law enforcement community in the state has endorsed the proposal. If it seems inconceivable that a Republican-led legislature would push for a law that police across the state see as dangerous, it is a reflection of how radical Wisconsin has gotten. As Capitol columnist Steven Walters has written, a hard right group of eight or nine state senators are likely to dictate much of what makes it into the state budget. On more general legislation like this, you need bigger numbers, but can still pass a bill with no Democratic support and some GOP dissenters. A Wisconsin Republican operative told the Washington Examiner the bill is likely to pass “with big majorities.” Others dispute this, saying passage is far from certain. “It doesn’t seem like there’s a lot of support coming from the Republican leadership on this,” says Bonavia. Gov. Scott Walker has yet to endorse the bill. The reality is that voters are not in favor of this bill. Palmer points to a survey his group commissioned with the St. Norbert College Strategic Research Institute, which found more than 70 percent of respondents opposed allowing concealed carry within K-12 schools and college campuses. Voters want more, not less restrictions on gun owners. A Marquette Law School poll found both gun owners and non-gun owners support requiring background checks of gun buyers, with 82 percent of owners and 81 percent of non-owners favoring this. Flynn and Mayor Tom Barrett have lobbied the legislature to pass such a law, with no luck. The reality is that the opinion of average voters counts less than the clout of the NRA, which spent $3.6 million since January 2008 to support GOP and conservative legislative and statewide candidates, including about $23,400 on the legislative elections last fall, as the Wisconsin Democracy Campaign reported. That included $75,900 in campaign contributions to nearly four dozen Republican legislators, who are the most likely candidates to support what Democratic state Sen. Jennifer Shilling has called a “completely irresponsible” bill. It is scary to me that Liberals might ever carry a gun, with their ignorance of things, they might shoot someone else beside themselves. Polls and opinions are all very interesting, but what is the data from the states which do not require a permit to carry concealed? Does permitless concealed carry ACTUALLY increase violent crime, reduce it, or leave it about the same? That really is the key practical issue, isn’t it? Speculation is fine: It can lead to research. Now, however, we have plenty of experience with permitless concealed carry. So what does that actual, real world experience say? Without data, the speculation is just that: speculation. It’s interesting that you agree with the concept of “with rights comes responsibility.” I do too. But does it only apply to the 2nd amendment? How about non-constitutional rights? Rights granted by the state? Rights presumed by certain advocacy groups? This law is an example of “everyone is doing it so we might as well recognize it as a right.” Sort of like smoking marijuana. Do you demand any legalization be done “with responsibility”? How about healthcare? Do you demand that people not abuse their bodies? How about welfare? Do you demand that people seek to become self-sufficient? How about voting? Do you demand that people become familiar with both sides of issues and where the candidates stand? We don’t want inconsistency in thinking, do we? Did you even read this WCD? Jim Palmer isn’t a liberal. Neither are the law enforcement officials quoted in the story who oppose this. Forget public opinion polls and rhetoric from representatives. What about actual law enforcement officials, those on the front lines of public safety. Those aren’t “liberals.” Why do they oppose this? Don’t they know what they are talking about here? Another solution looking for a problem. With restrictions on gathering information on the results of the loosening of gun restriction laws, we may never know what the effects of this kind of legislation will have unless we count on the press to cover every incidence of home injury or accidental shooting along with the more mundane armed robberies and drive-by shootings. What a ridiculously pointless article. These same law enforcement officials who oppose this new Right to Carry bill also fought tooth and nail to prevent the current carry conceal bill. The entire state hasn’t gone to hell since CCW legislation passed and in fact there have been numerous instances where a law abiding CCW person has stepped forward and prevented others from being killed. But the police officials don’t like that because they feel as though it makes them look bad. It truly isn’t the responsible law abiding citizens you need to be concerned with, it is the criminals who do not follow the laws as well as the lenient judges that keep turning these thugs loose because they haven’t yet tried every last option available to them short of just locking them up for several years which by the way is the only solution. The police are who you call if possible prior to you having to use deadly force to stop the criminal who is trying to take your life. Generally they won’t be there in time but will just have to sort out what happened afterwards. Chisholm and Flynn have pleaded with Wisconsin legislators to tighten the guidelines for concealed carry, to prevent “habitual offenders” (who’ve committed at least three misdemeanors) and those convicted of misdemeanors such as “endangering safety by use of a dangerous weapon” or “pointing or aiming a gun” from getting a permit to carry. So now they want to play the 3 misdemeanors equals 1 felony game? I never heard something so idiotic but then not surprised as I consider the two individuals pushing this nonsense forward. You never know Bruce maybe one day there will be responsible CCW person who saves your or one of your liberal friend’s life??? If so, will you be angry at them because they carried their weapon without training??? Sure Robert and maybe someday a person without training might shoot and kill your conservative wife. How would that make you feel? I say we get rid of driver’s ed and the driver’s license and just let people drive a car whenever they feel like it and whatever age they feel like. What’s the big deal? Why are some anti-gun control folks so against training people who want a concealed carry license? It makes no sense. They are dangerous. My sister’s husband (an MPD sergeant) wanted her to carry a gun. She said fine but wanted to shoot one at a range first. She did and it terrified her. She hated it and didn’t feel safe or comfortable shooting it, and decided she doesn’t want to carry one (and for what it’s worth she is totally apolitical). It is not unreasonable or an undue burden to require training for people who want to carry a concealed gun. The reality is that the opinion of average voters counts less than the clout of the NRA…….. Yes, but their vote does count. Crime, murders, car jackings, stolen cars, young thugs of all colors, are the creation of the Left in Milwaukee and Chicago, not the guns, that is fro sure. “Catch and release”, all these big shooting are by young thugs that should be in jai,l Frankovis, Clarke tell people the truth, and that is why they are respected, while the bleeding hearts laugh at the families that canot sit on their porches, their kids being killed . Place fault where it is Leftists, no one believes your crap. Speaking as retired cop, more of a nightmare morass for cops. Anybody anywhere in WI can legally be some angry drunk guy with a gun. I used to be a member of NRA back when they were a sane organization mostly concerned with gun safety. Now they are a nutjob politically alt-right lobby buying off politicians. And yes, I do hunt and legally CC. You write like an angry drunk guy with a gun. This proposal isn’t a nightmare for police – at least for competent police. As it stands though, most of today’s cops go from “Do you know why I pulled you over?” to shooting somebody in the face in a blink of an eye. Police your own ranks before telling law abiding citizens how they can/cannot protect themselves. Are seriously trying to claim Flynn isn’t a liberal? He’s a bigger lefty than you are. You know full well why the police don’t want this — they’re trying to monopolize the use of force and violence. It’s the same reason liberals are trying to disarm their fellow citizens. An unarmed population is easier to control. This has very little to do with making it easier for police to do their job. That tinfoil hat is on good and tight. No liberal I know wants to “disarm” the citizenry. That is fearmongering nonsense that the NRA uses to dupe its members into giving them money. It clearly works. You’re right, Flynn is not a liberal — he’s a liberal democrat. Classical liberals are actually libertarian or conservative leaning (and believe in freedom), whereas modern day liberals are regressive, Antifa, big government loving, SJW Marxists — or in other words, democrats. Deny it if you’d like, but Flynn is absolutely a lefty. Black people shoot each other and he blames white people for it. That is a telltale sign of a modern day democrat. So what if Romney appointed him to an oversight position? Romney is a globalist, just like Bush, Obama and Hillary. The sooner liberals stop pretending they don’t want to disarm the populace, the sooner we can discuss meaningful ways to improve firearm ownership and public safety. No tinfoil required. There will be blood in the streets I tell you! Just like in Alaska, and Wyoming, and Arizona, and Arkansas, and Kansas, and Maine, and Mississippi, and Missouri, and Idaho, and West Virginia, and New Hampshire! Those fools all passed the same law and now they’re all literally drowning in blood! Don’t travel to North Dakota either, they just passed it and when it comes into effect in a couple months, they’ll also be drowning in blood!. And lets not even get started on Vermont, where this has just always been the norm ever since Vermont was an independent republic 240 years ago… did you know “Vermont” is French for “Blood Mountain”!? They named it that because the maniacs have never required permits to carry, and so they’re literally the most violent place on earth! The whole state is literally just mountains of dried blood from all the violence. Won’t someone please think of the children!!! Now there’s a completely rational argument against reasonable regulation of firearms. Anyone who supports requiring permits for gun purchase and sale, background checks, closing of the gun show and private sale loopholes or restraining orders against those having access to guns using them against their families is a ‘liberal” but you will decide when those restrictions are not a pretense to disarming the population. No need to let us know what you all think are “meaningful ways” of improving gun ownership and public safety. We already know. “Meaningful ways to improve gun ownership and public safety” is “permitless carry which will take the US long way of the NRA goal of making sure every man, woman and child in this country is fully armed. I’m so looking forward to getting a Glock just to pick up a few items at the grocery. Oh, but that would be scary: a liberal with a gun? Might shoot someone besides myself.